I have finally, after 8 months, completed the second (and last) roman shade for our dining room. As mentioned before, I am really, really horrible about finishing projects. This project was especially bad because the construction of the first shade did not go smoothly. I bought the wrong amount of fabric so the construction of the second shade went even worse - I had to buy more fabric and piece it together to make the second shade. Ugh! I don't think I will ever learn the measure twice, cut once rule. 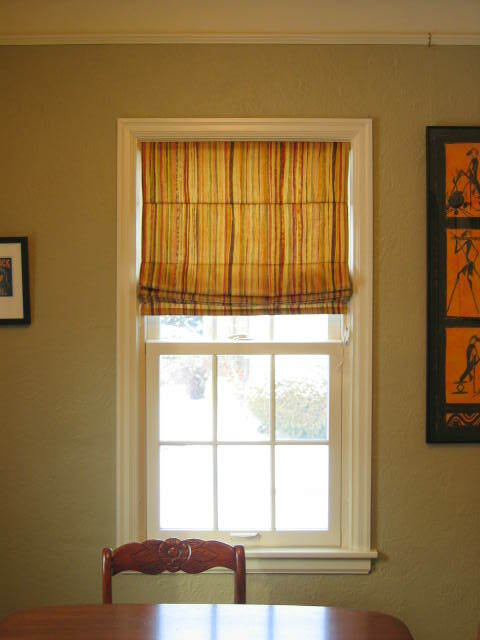 Somewhere between finishing the two shades I spent time scouring the web and every hardware/window treatment/craft store in town to find a cord anchor that 1)was small enough to fit in the window frame and 2)wasn't plastic. I finally found them at The Brass Handle in Edina for something like $2. I was just getting ready to post "don't you just love roman shades" when I actually read your blog and realized that you didn't. LOL Mine went together really easily - but I didn't use the rods in them.